Palma Vista is a fully secured community with gated access. 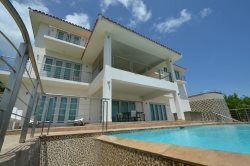 Palma Vista is the most desired location in Fajardo because of its boutique Resort Style design and proximity to the one of the best beaches in Puerto Rico, The Seven Seas. The apartment consists of 3 Bedroom, 3 bathroom which are fully furnished, bed and bath linens, beach towels and kitchen utensils. Air Conditioners in all bedrooms, TV/Cable and WIFI. You can enjoy all the comforts of our home on every room, including the private rooftop terrace and the Pool. Parking spots are available. Seven Seas is one of Puerto Rico’s most beautiful beaches, and is a Blue Flag beach, which means it has met the strict standards for water quality. It has an offshore reef that breaks the waves which makes it easy to swim and go snorkeling. If you like a more secluded beach you can take a short hike from Seven Seas to Playa Escondida (Hidden Beach) or La Playa del Gobernador. Luquillo Beach is only 15 minutes away by car and the famous Flamenco Beach in the island of Culebra are a very short catamaran ride or small plane flight from Fajardo´s Airport. The Nature Reserve, with its awesome bio-luminescent bay is just minutes away, where you can kayak under the stars and touch the waters that sometimes glow with bioluminescent organisms. For a totally different experience, El Yunque National Rainforest, is only 20 minutes away by car. Take a hike, enjoy the vegetation, mountains, go zip lining and bathe under a waterfall for an unforgettable tropical experience. El Yunque is one of the most biologically diverse of the national forests with hundreds of animals and plant species. In terms of food offerings, there are many local seafood restaurants within walking distance. For a wonderful variety, make sure to visit Los Kioskos in Luquillo, where you will find options from Seafood, Mofongo, beverages, all sorts of fried savory goodies and much more. Steps from the beach - Seven Seas, Las Croabas.